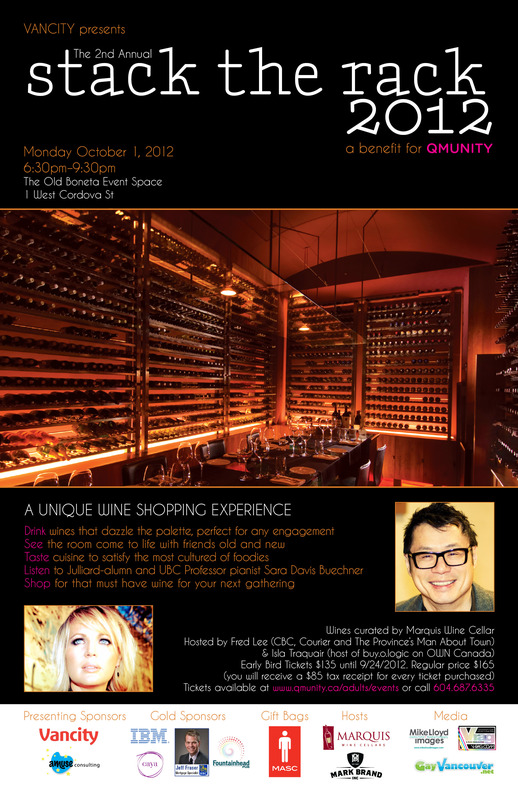 Stack the Rack – a benefit in support of QMUNITY, is back for its second year. Amuse Consulting + Vancity in partnership with Marquis Wine Cellars & Mark Brand Inc will hold the popular wine tasting event on Monday, October 1, 2012 at the Old Boneta event space on 1 West Cordova St.
@Amuse_events invited me to a preview, and I gotta tell you, you folks are in for a treat. The food will be amazing, and this event is a must for any wine connoisseur or for anyone who wants to start or expand their wine collection. More than a wine tasting event, Stack the Rack is a wine shopping experience. You’ll be able to purchase the wines that you enjoy that evening from Marquis Wine Cellars, as well as the opportunity to bid on some unique auction items. All the proceeds go to QMUNITY. QMUNITY is BC’s leading queer resource centre. Located on Bute Street in Vancouver’s West End, they are a hub for the lesbian, gay, trans, bi and queer community. They offer vital social services such as the Prideline Information and Referral Line, Anti-violence resources and Coming Out and Social Support Groups. The supports I’ve mentioned here are just the tip of the iceberg, they do so much more. Tickets sell out quickly, so make sure you get yours early. Click here to order.